This technique can eliminate downtime due to application deployment. 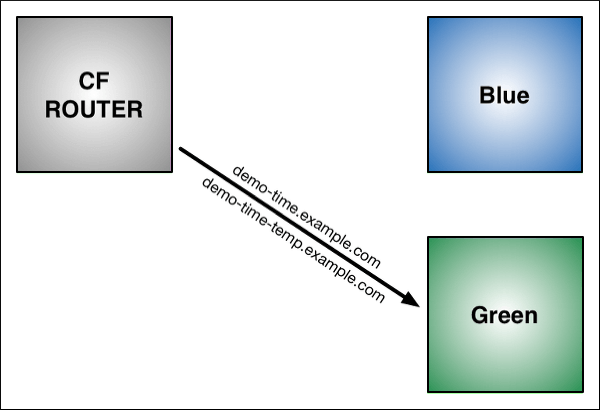 In addition, blue-green deployment reduces risk: if something unexpected happens with your new version on Green, you can immediately roll back to the last version by switching back to Blue. For this example, we’ll start with a simple application: “demo-time.” This app is a web page that displays the words “Blue time” and the date/time on the server. Two instances of our application are now running on Cloud Foundry: the original Blue and the updated Green. Now that both apps are up and running, switch the router so all incoming requests go to the Green app and the Blue app. Do this by mapping the original URL route (demo-time.example.com) to the Green application using the cf map-route command.